Idel-Ural is a historical region in the East of the European part of the Russian Federation. Even now, being under the total control and pressure from Moscow, the peoples of Idel-Ural continue their struggle for national identity and sovereignty. The region remains a hidden geopolitical hotspot that can manifest itself in conditions of the current political turbulence. In the east of the European part of Russia there is a historical region which is called Povolzhye (region along the Volga River) by the Russians and Idel-Ural by the indigenous population. The region consists of six states: Erzia-Mokshania (Mordovia), Chuvashia, Mari El, Tatarstan, Udmurtia and Bashkortostan which have their own unique cultures created by seven indigenous peoples. Finno-Ugrian peoples of Erzia, Moksha, Mari and the Udmurts live near their Turkic neighbours: Chuvashes, Tatars and Bashkirs. Idel-Ural states are so much different from the neighboring Russian regions that Moscow had to give each of them the status of an independent republic with its own constitution, state language and organs of governance. Today these republican attributes are rather a theatrical decoration which conceals harsh centralism and submission to Moscow. It was not always like that. In the early 1990s, when the federal center was weak and irresolute, each of the republics obtained numerous sovereign rights. During that time national parties, civic and political organizations mushroomed, and there was hope that the republics can be let “float freely”. A political map of Idel-Ural, which was presented at Book Forum Lviv on September 23, 2018. Idel-Ural is the territory where two worlds – the Turkic and the Finno-Ugrian cultures – meet and actively interact. Notwithstanding the differences in religion and cultural traditions, interaction of Turkic and Finno-Ugrian peoples did not give rise to bitter feud or isolationism. Quite the contrary, Idel-Ural can be called an integral space that preserves identity of the title nations for many centuries by presenting opposition to russification and blurring of ethnic, linguistic and religious lines. and its population is comparable to population of Greece (10 741 165 people) . In 1919-1925 Bashkortostan, and thus Idel-Ural, had common border with Kazakh Autonomous Soviet Socialist Republic (that was the name of Kazakhstan at the time). However, in 1925 Bolsheviks excluded Province of Orenburg from the Soviet Kazakhstan and gave it to the Russian Soviet Federative Socialist Republic (RSFSR). Capital of Kazakhstan was transferred from Orenburg to Kzyl-Orda. Thus, the so-called Orenburg corridor which divided the two Turk republics was formed. At first the corridor that separated Kazakhstan from Baskortostan was only 30 km wide. The fear that friendship between Bashkirian and Kazakh peoples would become “too close” made Moscow “revise the borders” several times. As a result, the corridor increased nearly twofold. Today Idel-Ural republics have no exits to external borders, and the distance between the southern border of Bashkortostan and the northern border of Kazakhstan is approximately 50 km. was digested by Muscovy and now by the Russian Federation for half a millennium, the Volga Tatars managed to keep their identity, and now they serve as an example for their neighbours. The Tatars achieved great successes in development of culture – the first Tatarian book saw the light of day in 1612 (it was a Tatarian grammar book). Kazan has become an important book-publishing center of the Russian Empire. The books were published not only in Tatarian language, but also in the languages of almost all Idel-Ural peoples. One of the first measures of the sovereign Tatarstan in the early 1990s was foundation of the Tatarian Magarif Publishing House which has published one and a half thousand books with total circulation of 18. 5 mln copies in less than thirty years [3, 2]. Today, in addition to the republican authorities, a lot of volunteers work to further develop Tatarian science and culture. Not only classical works of the world literature (including the works of ancient philosophers), but also modern-day scientific studies in the fields of physics, mathematics, medicine, astronomy, etc., are translated to Tatarian language. The Tatarian translators work more with English and Turkish languages than with Russian language. In the last few years there appeared dozens of TED video lectures translated into Tatarian. There are even programming textbooks in Tatarian – it is something unimaginable for a majority of the indigenous peoples of the Russian Federation . Such great achievements in development and preservation of the Tatarian culture would have been impossible without significant intellectual and financial resources. Resistivity of the Tatarian nation to assimilation processes is due to a number of the national features: determination, persistency, entrepreneurial skills, and belief in Islam in combination with maintenance of national traditions. The Tatarian infrastructure, education and science projects, together with meagre autonomy for implementation of its own humanitarian policy which Moscow begrudgingly granted to the republic, show that Tatarstan is very important for the Russian economy. Every year the republic appears in the TOP-10 of the most economically developed constituent entities of the Russian Federation. Tatarstan is a region where important industries are concentrated: oil production and oil processing, aircraft engineering, communication, production of explosives, machine-building, car production. Important Russian infrastructure facilities are located on the territory of the republic: oil and gas pipelines, two international airports, railway lines, bridges across Volga and Sviyaga. [5, 20–21]. For many centuries Moscow tried to neutralize the Tatarian drive for revival of sovereignty by involving the Tatarian people in the process of Russia’s expansion (Russian Empire, the USSR and later the RF). However, with the onset of Perestroika the desire to restore the Tatarian nation reappeared. In 1988-1990 Tatarstan saw appearance and development of political parties, civic organizations and movements which Moscow could not control: Tatarian Civic Center. Azatlyk Youth Alliance, the Party of Tatar National Independence Ittifak, Milli Mejlis (a self-proclaimed pan-Tatar parliament established to create opposition to the republican parliament which was controlled by the Communists), etc. Founded in April 1990, the Ittifak Party (“ittifak” is “harmony” in Tatarian) openly declared that it had intentions to fight for the sovereignty of the republic. The party quickly gained popularity among Tatarian urban intellectual class and radical youth. Tatarstan was the first among the republics of IdelUral to declare independence (30. 08. 1990) and to proclaim its intention to be a self-sustained sovereign state. In 1991 in the RSFSR presidential elections were held; Tatarstan was also electing the President of the republic. Tatarian radical circles supported by the official Kazan authorities tried to boycott elections of the President of Russia on the territory of the republic. As a result, 36. 6% of Tatarian voters took part in the election of the President of Russia, and 65% – in the election of the President of Tatarstan. In Tatarstan Boris Yeltsin received 16. 5% of the votes, and Mintimer Shaimiev – 44. 8% [6, 4]. “Хәтер көне” (Remembrance Day in Tat. ), national celebration of shahids who fell in the battles against the army of Ivan the Terrible in 1552. Demonstrators carry a placard that reads “Our goal – independence!” Kazan, 2013. At first, in 1990 the party nomenclature of Tatarstan tried to ignore the new political players. Later, in the first half of 1991 the Communist-led officialdom of Tatarstan made an attempt to use national movement in its “game of counterweights” with Moscow spooking the Kremlin with the nationalists coming to power and claiming that dialog with the latter would be impossible. However, in December 1991 positions of the Tatarian national movement represented first of all by the Tatarian Civic Center and the Ittifak Party strengthened: individual organizational units were made larger, managerial personnel for local party cells were prepared, publication of their own periodicals got underway. sovereignty which dwindled over the years, meanwhile Moscow overmastered Tatarstan with its resources still further. One of the reasons why Kazan has lost in its political confrontation with Moscow was the fact that Tatarstan had no common borders with independent states. In the early 1990s Idel-Ural was surrounded on all sides by “Russian sea”, and it could have exit to an external border only in the south. Unlike Tatarstan, Bashkortostan entered Perestroika under quite different initial conditions. The Bashkirs inherited a whole lot of ethnic and territorial problems from Stalin’s national policy. The modern-day borders of the Republic of Bashkortostan differ greatly from Bash Kurdistan for which the Bashkirian national hero Ahmet Zakie Validi has been fighting in 1919. At that time, one hundred years ago the Bashkirian Republic (Bash Kurdistan is another official name) included the eastern part of today’s Bashkortostan and several enclaves in the south and in the east. Bash Kurdistan had no towns, its capital was in the village of Temyasovo. At the same time, the republic had an advantage – relatively high level of ethnic homogeneity – over 60% of population were Bashkirs . However, in 1921, when Ahmet Zaki Validi has emigrated, the new head of the Bashkirian government Mulayan Khalikov asked Moscow to expand the Bashkirian borders. Eventually, Bashkortostan was given vast territories with towns, quarries, railway lines, but the republic lost its monolithic stature. When Perestroika arrived, Bashkortostan was in a poor state. In the general population structure the Russians comprised 39. 27%, the Tatars – 28. 42%, and the Bashkirs only 21. 91% . Therefore, the Bashkirs had to face not only the danger of russification, but also the risk to “dissolve” among the Tatars who were more numerous and more influential. In 1988 an idea of creating a civic organization that would deal with the issues of Bashkirian national revival quickly gained popularity among the Bashkirian intellectual class. In May 1989 the founding convention of the Republican Club of Bashkirian Culture was held in Ufa; Rashit Shaukr, a poet, became the head of the Club [10, 125]. In December of the same year the first congress of representatives of the Bashkirian people was held; 989 delegates took part in its work. The congress approved the statute of the Bashkirian People’s Center “Ural”. Aims, goals and structure of this organization were similar to those of the Tatarian Civic Center. 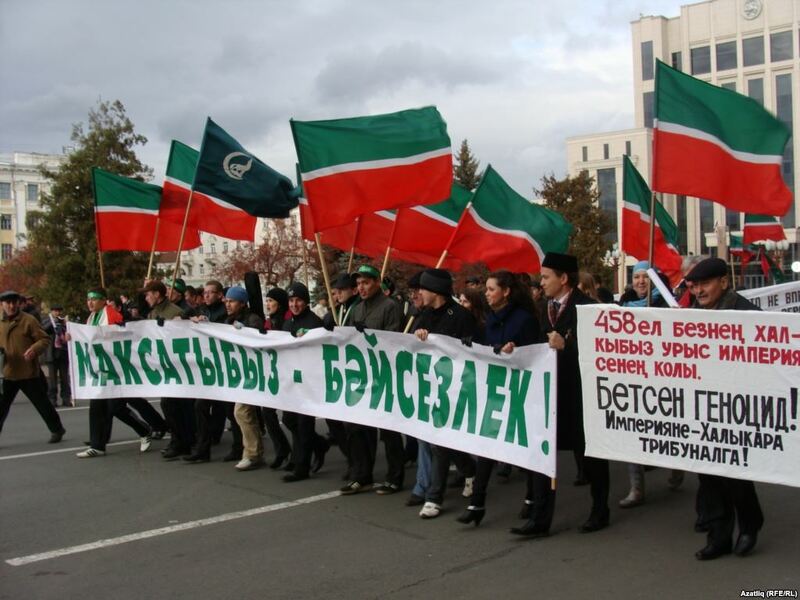 The BPC “Ural” launched a campaign aimed at forcing central authorities to grant Bashkortostan a Union Republic status. At first the attitude of the party leaders of Bashkortostan toward the activities of the BPC “Ural” and the above mentioned campaign was negative. However, with time, when they grasped practical benefits they could get from the sovereignty of the republic, Bashkortostan leaders changed their attitude toward the BPC “Ural” . with the Russian and Bashkirian languages, and that the western regions of the republic were transferred to Tatarstan. In 1991 the Tatarian Civic Center in Bashkortostan even demanded to hold a referendum in the western regions of Bashkortostan seeking popular support there for transfer of those territories to Tatarstan . The situation was further complicated by populistic, and sometimes aggressive, declarations from both Tatarian and Bashkirian sides. Now it is obvious that growth of national movement triggered by the collapse of the USSR, gave rise not only to the development of the national self-awareness and dissemination of ideas of the national identity, but also stirred up latent conflicts between two brotherly Turkic peoples – the Tatars and the Bashkirs. Chuvashian Republic . Let us notionally call this group (ChNRP and ChNC) a republican one. In December 1989 elections to the Supreme Council of the Chuvashian ASSR were held, in which the republicans took an active part. Based upon the results of the elections, the Communists were able to form a parliamentary fraction consisting of 101 parliamentarians (the Parliament had 200 members). The National Democratic fraction which included the republicans headed by a prominent Chuvashian scientist Atner Huzangay consisted of almost 20 parliamentarians [14, 22]. The biggest achievement of the republicans was approval of the declaration of sovereignty of the Chuvashian Republic by the Supreme Council of the Chuvashian ASSR on October 24 1990, and soon afterwards the Law “On Languages in the Chuvashian Republic”. In late August 1991 the Chuvashian Parliament supported by the Chuvashian national movement established the institution of presidency. In December of the same year the first democratic Presidential election were held. 58. 6% of the total number of voters took part in the election. Parliamentarian Atner Huzangay and Lev Prokopyev, exPrime Minister, representative of the party nomenclature, made it to the second round of the election. Although Hunzagay has won (he received 46% of votes), the election was declared invalid, since the candidate did not win 50% of votes stipulated in the Law . surrendered to Moscow’s policy of centralization and behaved rather as a governor and not as a president. This helped Fedorov to stay in the office till 2010. In 2012 the institution of presidency in Chuvashia was liquidated. Russian Federation as its parliament” [21, 59]. In the beginning of 1996, after a series of terrorist acts the blame for which Moscow put the blame on the Chechen resistance movement, the position of the Chuvashian top authorities in regard to the Chechen war underwent changes. However, in the spring of the same year the Parliament of Chuvashia found courage in itself to pass a declaration in regard to the situation in Chechnya calling for immediate cessation of hostilities . at the Chuvashian people. As a result, a conflict between the republicans and the President broke out. However, in 1997 Gennady Arkhipov became the head of the ChNC. During his time in the office the organization lost all remnants of independence and gave up on opposing Moscow. peoples of Russia in May 1992 (Izhevsk). All those congresses carried similar resolutions which called for democratization of political and social life in the republics, national revival of the FinnoUgrian peoples. Certain influence on formation of the attitudes and opinions which dominated at the congresses, especially among the national intellectual class was exerted by Estonia, since many representatives of the Finno-Ugrian republics of Russia were alumni of Tartu University . be very active. Moderate Mari Ushem became pan-national Mari organization which united thousands of teachers, scientists, cultural workers. (some researchers consider these dialects two separate languages). Hill Mari are less numerous, they embraced Christianity a long time ago and almost completely renounced their pagan beliefs. The rest of the republic is inhabited by Meadow Mari who are pagans. According to the poll conducted in 2000-2003, in the Republic of Mari 7% of population are pure pagans, 60% practice both Christian religion and pagan rites, and only 30% are Orthodox Christians who are predominantly ethnic Russians. Mari expatriate communities scattered around other Idel-Ural republics are descendants of pagans who fled from forcible Christianization. Thus, 90% of Mari diaspora on the territory of Idel-Ural are practicing pagans . republic, and in December 1991 the presidential election was held. The pre-election campaign and its results were very similar to those of Chuvashia: participation of a representative of the national movement in the election, his defeat and concentration of power in the hands of former representatives of the party nomenclature. an example to follow in order to implement their plans of revival. Numerous terms and even some religious postulates were borrowed by the Maris from Islam through the Tatars. pressure on Zotin was so strong that he had to invite also the Supreme kart (animist priest) of Oshmari-Chimari Aleksandr Yuzikain who was placed next to the Orthodox bishop in the VIP box. As a result, the President of Mari El received blessings in both traditions – orthodox and pagan. The national revival of Udmurtia was proceeding in the wake of the neighbours and had but a few manifestations worth mentioning. When the USSR was collapsing, percentage of the Udmurts in the population structure of Udmurtia was only 30% (compare with 52% in 1926); that is why the Udmurts could neither occupy key managerial positions in the republic nor dictate their own “rules of the game” in politics . The characteristic feature of the national political revival of the Udmurts in 1988-1991 was the intensified cooperation with the international Finno-Ugrian movement: establishment of close contacts with civic organizations and funds based in Estonia, Finland and Hungary; fast development of the Udmurtia literature (especially translations). of the population of the republic. At the same time, here the process of the national revival proceeded faster than in Udmurtia due to extremely weak positions of Moscow Patriarchate in Mordovia – only 10 parishes in 1987 . Return of the Erzians and the Mokshians to their national identities met with the challenges presented by russification, urbanization and demographic crisis. But more challenges were to be faced. Some part of the national elites of the Moksha people and, to a lesser extent, of the Ezrians came out with a concept that erzia and moksha are sub-ethnoses of the single Mordovian people. This concept met with fierce opposition from the representatives of the Erzia national movement who saw the Mordovian project as an instrument of assimilation of the Erzians into the Russian identity. some active members of the Center felt that rigid frames of the national cultural activity do not suit them, and Velmema broke up. Moderate members set up an organization called Vaigel’ which is engaged in activities connected with the revival and dissemination of national traditions; more radical members created the Erzia-Mokshanian civic movement called Mastorava which deals not only with the national revival of erzia and moksha but also strives to represent their interests in the power structures. National Theatre was opened, the National Culture Center Department was opened, the Law “On Languages” was passed, and the work with expatriate communities was on the rise. The above mentioned organizations became a “talent pool” for new social organizations of erzia and moksha: Od Vii, Erziava, Litova and Yurkhtava, Mastorava and Erzian Mastor newspapers. Activities of all mentioned organizations and societies allowed Erzia and Moksha national movements to switch from the ethnographic phase to political phase in their development. Religious revival which proceeded in two opposing directions – return to traditional monotheistic religion (Ineshkipazia) and development of Lutheranism – has played an important role on the process of de-russification, especially among the Erzians. toward the revival of ethnic religion – religion of the god Ineshkipaz. priestess), and the erzia national faith issue became the subject of discussions by scientists and theologians in Saransk . In parallel with the revival of Ineshkipazia in Mordovia, the Moksha-Erzia Evangelic Lutheranian Church has been established. In late 1980s a talented erzia ethno-futurist artist Andrey Alyoshkin moved to Leningrad. There he made a number of paintings in which he tried to reveal the essence of the ancient beliefs of erzia and moksha. A Lutheran pastor Arvo Survo – a leader of the religious revival movement of the Ingrian Finns – noticed the talented artist and converted him to Lutheranism. etc. ) in religious services. Lutheranism left a significant imprint in the contemporary history of erzia and moksha. Even today on the territory of Erzia-Mokshania there are several parishes which belong to the Ingrian Evangelic Lutheran Church. The major part of national and political achievements of the Idel-Ural peoples is the result of a short period of relative freedom in the USSR and later in the Russian Federation from 1988 to 1999. After Vladimir Putin came to power, the Kremlin headed for rigid centralization. The most independent and rich constituent entities of the federation, first of all Tatarstan, fell victims to this policy. In 1998 the Tatar newspaper Altyn Urda was shut on accusations that it stirred up national hatred. For some time the newspaper was published unofficially, but eventually the authorities closed it completely. In 2001 the Russian legislation banned activities of the national political and national parties. Numerous civic organizations and movements of the indigenous peoples stopped their activities due to legal persecution and pressure from security services. Among them were the Party of Tatar National Independence Ittifak, the Mari Kugeze Mlande, the Chuvashian National Revival Party, etc. In 2002 the founder of the Erzia Od Vii organization Yovlan Olo suddenly died in Saransk falling victim to some mysterious disease. During the first ten years of Putin’s time in the office, only in Tatarstan 690 Tatar schools were liquidated. Leaders of Tatar national movement Fauzia Bairamova, Rafis Kashapov, Nail Nabiullin were legally persecuted. Sovereignty of all Idel-Ural republics was significantly limited. The institution of presidency was abolished everywhere, except for Tatarstan. In 2018 amendments to the Federal Law “On Languages” have been introduced. In accordance with them, the official state languages of the national republics ceased to be mandatory for teaching in general education schools. A lot of teachers of Tatar, Bashkirian, Chuvash and other languages lost their jobs because of these amendments. 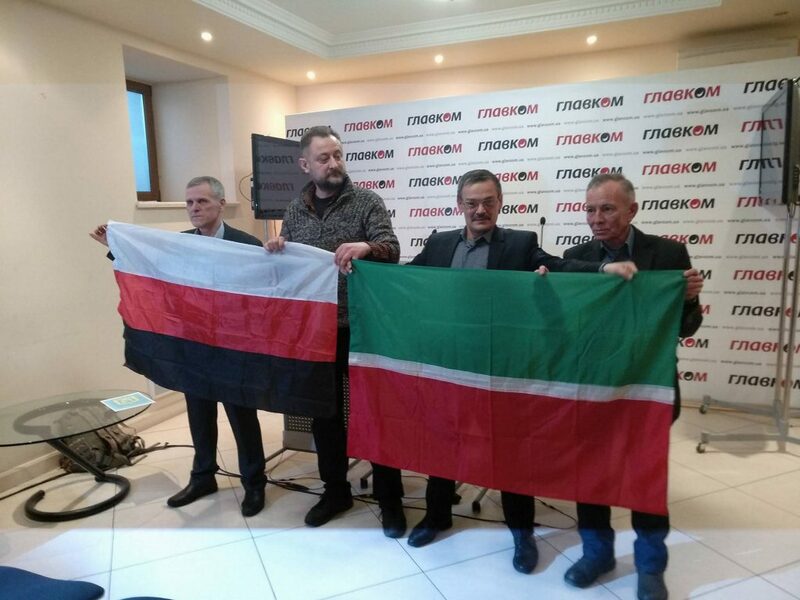 spring of 2018 a group of political emigrants announced the establishment of the Free Idel-Ural civic movement which intends to wage nonviolent struggle for sovereignty of the six republics of Povolzhye Region . Despite the fact that the current political climate in Russia does not make it possible to speak of any serious transformations inside the federation, the national movements of the Idel-Ural peoples continue their activities in conditions of total control and unprecedented pressure. Therefore, Idel-Ural remains to be a hidden geopolitical factor which may manifest itself in conditions of today’s political unrest. 5. Information about living conditions of population. // Analytical materials. – 2017. – No 12. 6. Tataria: disposition for federalists // Panorama. – 1992. – No 2 (32). 7. Statement by the President and the Chairman of the Supreme Council of the Republic of Tatarstan of June 24, 1993 / White Book of Tatarstan. Road to Sovereignty // Panorama-Forum Magazine. — 1996. — No 8 (Special issue). 14. V. R. Filippov. Chuvashia in the 90s: ethno-political essay / V. R. Filippov. – Moscow: The Russian Academy of Sciences, 2001. – 250 p.
16. The State Program of implementation of the Law “On Languages in the Chuvashian Republic” for the period of time between 1993 and 2000 and beyond. // Soviet Chuvashia. 1993. July. 17. Spirit and ideas always win in the end. Interview. – Irekle Samsh – 2012. 21. V. R. Filippov. Chuvashia in the 90s: ethno-political essay / V. R. Filippov. – Moscow: The Russian Academy of Sciences, 2001. – 250 p.
28. Mariz Kemal. Min’ – erzyat’!